There are several possible causes of inflammation to the pancreas. Some of them are nutritional factors, such as high levels of fat in the blood (lipemia), high levels of calcium in the blood (hypercalcemia), trauma to the pancreas, and some drugs or toxins. Obesity linked to a high fat and low carbohydrate diet has also been shown to be a risk factor for this inflammation disorder. Your veterinarian will also check for the presence of gallstones, and for a condition referred to as reflux. A fill blood work up will be ordered to see if there are any nutrient imbalances, and X-ray imaging will be used to look for evidence of any blunt damage to the pancreas. Pancreatic and liver enzymes will be measured to analyze for increases of either in the bloodstream. Insulin will me measured to check for normal levels, since inflammation can cause insulin producing cells in the pancreas to be damaged, possibly leading to diabetes. Diabetesis rare, but can occur, especially with dogs. In some cases, an ultrasound will be performed to look for mass tissue growths, cysts, or abscesses in the body. A needle biopsy may also be taken along with the ultrasound. 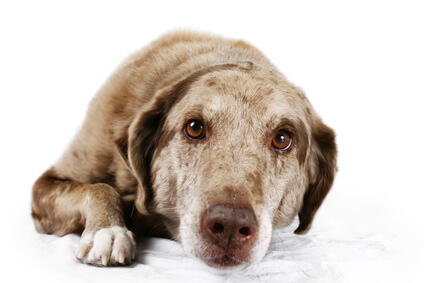 Dogs with acute pancreatitis require hospitalization to treat shock and dehydration. The most important step in treating pancreatitis is to rest the gland completely. This is accomplished by giving the dog nothing by mouth for several days and maintaining fluid and electrolyte balance with intravenous saline solutions. Antibioticsare used to prevent secondary bacterial infections. Pain is controlled with narcotics. Cardiac arrhythmias, if present, are treated with anti-arrhythmic drugs. Dogs who do not respond to medical treatment may require surgery to drain an infected pancreas. The prognosis for dogs with shock and spreading peritonitisis poor. Dogs who recover from pancreatitis are susceptible to recurrent attacks, which can be mild or severe. These episodes can be prevented, in part, by eliminating predisposing factors. For example, place overweight dogs on a weight-loss program. Feed the total daily ration in two or three small servings to avoid overstimulating the pancreas. Do not feed table scraps. Dogs with high serum lipid levels (determined by your veterinarian) should be placed on a fat-restricted diet. If scarring has damaged the acinar or islet cells, your dog may need supplemental treatment such as enzymes or insulin.